The 2014 Miami Dolphins season was the franchise's 45th season in the National Football League, the 49th overall and the third under head coach Joe Philbin. The team had a new general manager for the first time since 2007 after Jeff Ireland was fired on January 7, 2014. 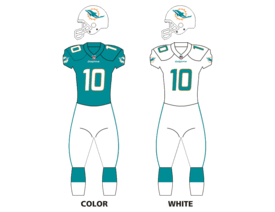 The Dolphins equaled their 8–8 record from 2013 and missed the playoffs for a sixth consecutive season. The Dolphins traded their original second-round selection (No. 50 overall) to the San Diego Chargers in exchange for the Chargers' second- and fourth-round selections — Nos. 57 and 125 overall. The Dolphins later traded the No. 57 selection to the San Francisco 49ers in exchange for the 49ers' second- (No. 63 overall) and fifth- (No. 171 overall) round selections. The Dolphins traded their original third- (No. 81 overall) and fourth- (No. 116 overall) round selections to the Oakland Raiders in exchange for the Raiders' third-round selection (No. 67 overall). Assistant Offensive Line – Jack Bicknell Jr. The game's overtime ended when defensive end Terrence Fede blocked a punt to the endzone for a safety. Despite the win, the Dolphins were eliminated from playoff contention after the Steelers beat the Chiefs on the same day. ↑ Hanzus, Dan (January 7, 2014). "Jeff Ireland, Miami Dolphins mutually part ways". National Football League. Retrieved January 7, 2014.